Downtown Nashville offers some of the best condo buildings in the city. It’s filled with high-rise options offering great views. If you’re relocating to Nashville or you’re moving downtown and you want a view, here are some of the very best options. This 22-story building offers plenty of great views to enjoy. Icon in the Gulch provides floor-to-ceiling windows in every single unit giving residents unobstructed views of the city. Some of the units also have private balconies and the higher up you live, the better the view will be. A great choice for those looking to enjoy plenty of great views of the city, Encore Nashville offer city views you simply cannot beat. A 20-story high-rise, this building stands more than 250 feet tall. This is a popular area of the city, as well and the building was constructed in 2008. Those looking to live across from the Schermerhorn Symphony Center and enjoy great views will enjoy living at Encore Nashville in the SoBro neighborhood. Another building with floor-to-ceiling windows making it easy to enjoy the views is 505 Nashville. 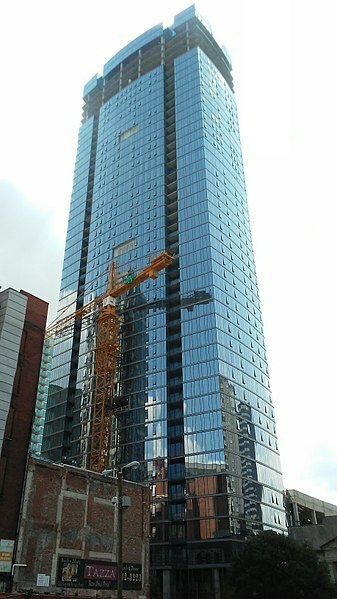 This building stands 45-stories tall, making it one of the tallest on the list. Enjoy incredible views of the city and the Cumberland River from your unit in 505 Nashville. These luxury condos have plenty to offer with several great amenities and plenty of common areas to enjoy the views. Each condo includes high ceilings and floor-to-ceiling windows to ensure every unit offers an amazing view. Another great Downtown Nashville building, Twelve Twelve offers a 23-story tall building that was completed in 2014. The amenities list is long for this building and the floor-to-ceiling windows allow residents to enjoy incredible city views. Twelve Twelve is found in The Gulch, so not only do you get great views, but you also get to live in one of the most popular Nashville neighborhoods. When you want to live in Downtown Nashville and you want a great view, these condo buildings are your best choice. Each offers great views with the views only getting better the higher up you live. Properties marked with the IDX logo are provided courtesy of the RealTracs Internet Data Exchange Program. Some or all of the listings may not belong to the firm whose website is being visited (The Kelton Group with Pilkerton Realtors, (615) 200-6260). IDX information © 2019 MTRMLS, Inc. Information is believed to be accurate but not guaranteed by the MLS or The Kelton Group with Pilkerton Realtors. IDX information is provided exclusively for consumers' personal, non-commercial use and may not be used for any purpose other than to identify prospective properties consumers may be interested in purchasing. Data last updated 2019-04-26T00:05:13.753.